Bathrooms: 6 "5 Master Suits"
Garage: Double, Attached "Huge Storage Area"
Size: 8,000 sq. ft. "Hacienda Style Casa"
Lot Size: 2800 sq. m.
Walk the beautiful white sand beaches. Play in the sea, sun yourself on the beach, relax on the beachside patio, prepare fresh seafood from the ocean in this grand, gracious Hacienda style Beachfront Estate. Five private bedroom suites with fireplaces, each accessed from two classic interior breezeways surrounding a lovely green and growing landscaped interior courtyard. Marvelous Ocean front Master Suite with exterior beach access doorways, two sitting areas, fireplace, large bath with ocean views. Main wing with 20 ft high beamed ceilings. Great Room, Open Kitchen and dining area with adjoining lounge area. Doors to the beach abound. Ocean Side tiled patios along the sea. Grand stairway to the beach. Large protective sea wall on beachside. Separate one bedroom Casita. Generous off street walled and gated parking areas. Large 2 stall garage with huge storage area. VERY MOTIVATED OWNER SAYS " MAKE AN OFFER"
Hacienda Style ocean front Beach Estate. 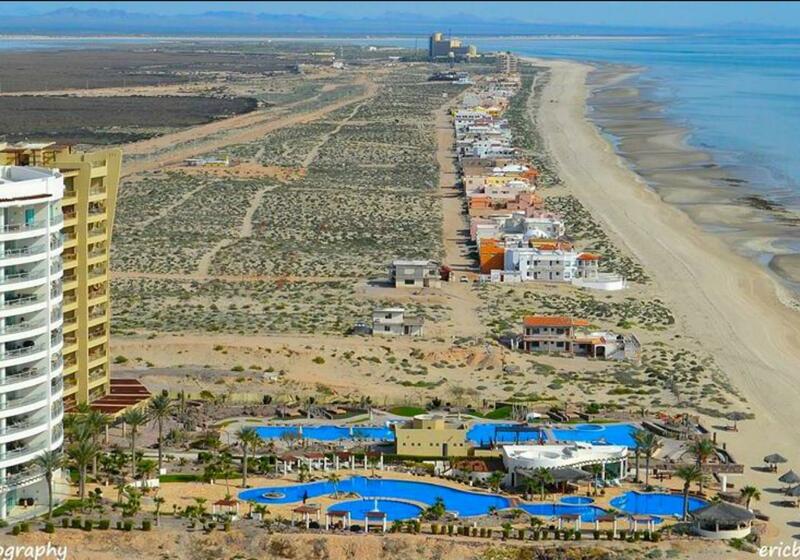 Panoramic, unobstructed views of the Sea of Cortez. 5 Bedroom suites, 6 baths. Grand Master Suite. Generous Beach Side Tiled Patios Beautiful landscaped interior courtyard. Seperate 1 Bedroom Casita. Two Stall garage with huge storage area. Lots of vehicle parking. Property is walled and gated.